It's interesting that after five years of doing this blog there are still a few fairly common models that I have posted about. I've done over 525 different models after all, yet there are still some easily found models that enable me to keep going. One of them is the 1949 Darrell. One of the reasons that I haven't landed a Darrell is they hide in plain site. It's easy to confuse a Darrell with a Dunham or a Dexter... and they all seem to show up for sale regularly. The trick with any of them is to get one with a decent case. The Darrell was made from 1949 through 1951. 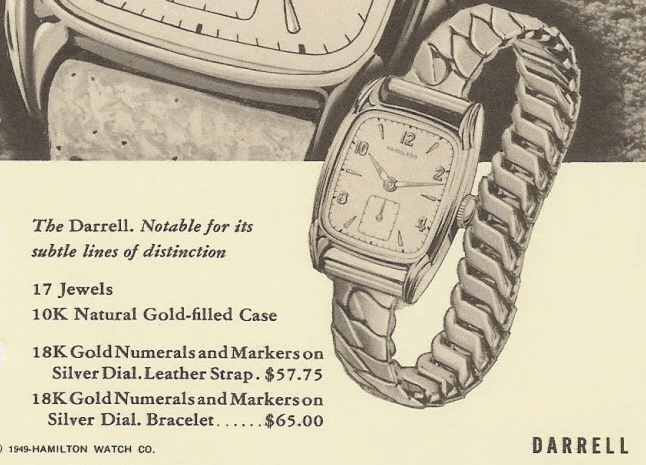 The Darrell was one of the first watches to be paired with a strap or a bracelet. 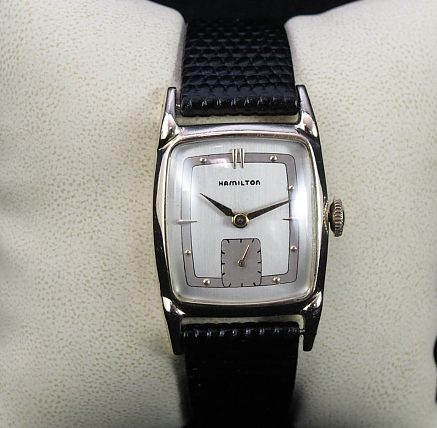 The white finished sterling silver dial has solid 18K gold numerals and markers. The case is 10K yellow gold filled. 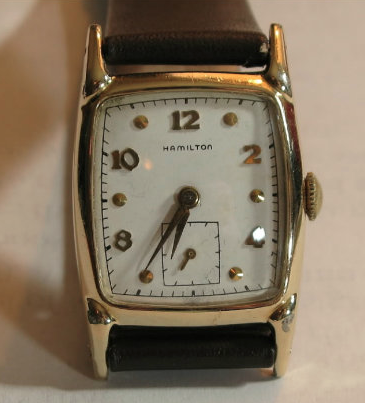 Tucked inside the Darrell you will find Hamilton's 8/0 size 17 jewel 747 movement. I'm sure I'm not the only watch enthusiast who has worn more than one watch at a time. 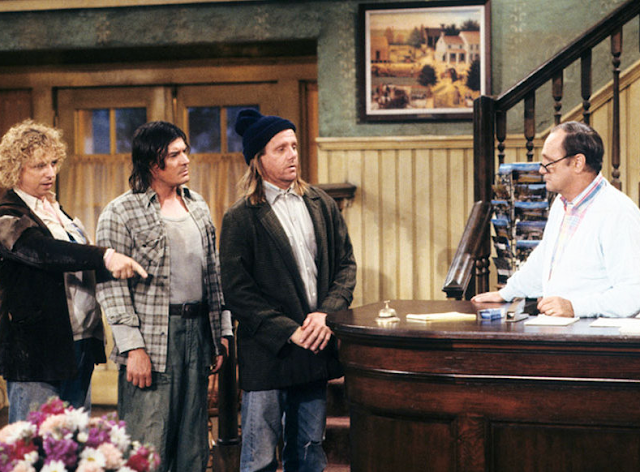 The Darrell would be a perfect model to do that as it always reminds me of the 1980's TV show, "Newhart". You could say, "My name is Larry and this is my Hamilton Darrell and this is my other Hamilton Darrell". I had mentioned that it's important to get a model with a good case. 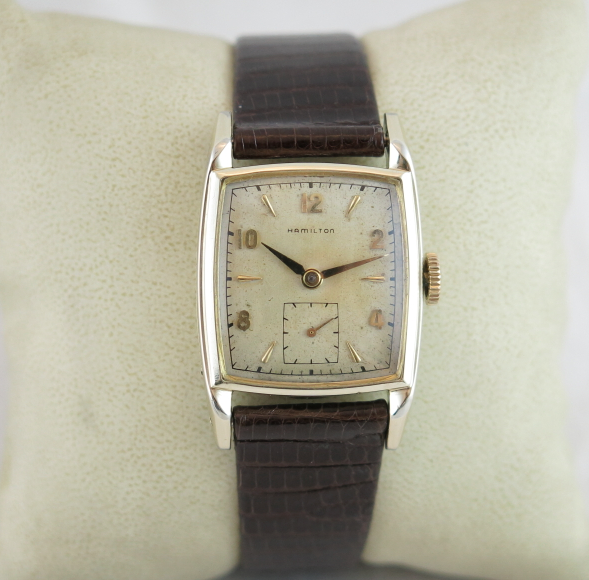 The bezel of the Darrell has very pronounced lugs and they often will show brassing along the tops from decades of long sleeve shirts rubbing up against them. The edges of the case backs can also exhibit wear through. I recently landed a fairly decent example. It's a little dirty and the crystal is beat up but the case is actually in great shape. The case back shows very little wear too and with a gentle polish it will look even better. I like the 747 movement. It's probably my favorite movement because it's very straightforward. That's not to say that it's trouble-free but there aren't a lot of hidden traps to avoid with a 747 movement. As long as you don't screw with the hairspring, it's about as simple as a Hamilton can get and almost always goes back together nicely. The dial is dirty but it's not ugly so hopefully I can clean it up without losing any of the printing. The back of the dial is unmarked so there's a strong possibility that this dial is original to the watch. The 747 spans the period between blue steel mainsprings and white alloy Dynavar springs. This is the older style spring and there's a good possibility that it's set and will need to be replaced. Yup, as expected the mainspring stays in a small coil when removed from the barrel so it's lost a lot of it's strength. The watch would probably run for about 24 hours with this spring instead of the usual 40 hours or so you could expect with a new mainspring. While everything is being cleaned I will prep a new crystal for installation. This one is double thick so it will help protect the lugs of the case from wear. I have a nice Dynavar spring to install. There are different strengths you can use and this one is the 71. I'll have to see how it does. This is what a mainspring should look like when it's out of the barrel... it actually coils in the opposite direction... the center of the spring is on the right side. It reminds me of a Treble Clef from a musical staff. The spring is wound into a coil and inserted into the barrel. Then the arbor is installed and a little mainspring grease is added for lubrication. The watch is now running with good motion so it's off to the timer. Well, this was very puzzling... the watch would run nicely for about 15 seconds and then I'd get this crazy pattern. I recleaned the balance and it happened again. It would run okay briefly and then go all wonky. Is my hairspring sticking to itself? I tried a couple of other balances and none of them would work well. Then it dawned on me... I bet the mainspring is too strong and it's making the balance swing all the way around almost 360 degrees and the balance impulse jewel hits the other side of the pallet fork and rebounds. Sure enough, I put a less strong (63 strength) mainspring in the barrel and it evened out better, still with high amplitude. It took a slight tweak to the regulator to bring the beat rate right in line. My new crystal and a new black strap complete the restoration. My merciless camera makes the dial look a lot more toned than it really is. It's actually a very pleasant parchment color and pattern. And just for comparison, here's a picture of the Dunham and the two Dexter dial variations. As you can see, the three models are very similar. Dexter with numeral and dot dial. Hi- I just received a Darrell for Christmas. Glad you had this page so I could track down the model and approximate date! The crystal's a bit scratched. Is there a reliable place online that still has replacement backstock?